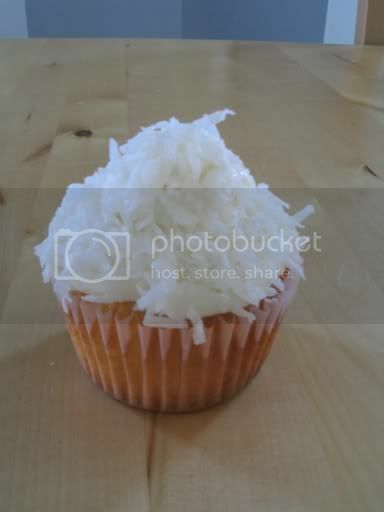 Cupcake, my love: Oh my god!! "Uum...Steph...look who it is! 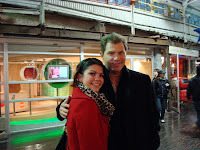 I think that's Bobby Flay" was the only thing my mom had to say while in Chelsea Market in NYC. And you know what...she was right!! I turned around and my mouth dropped, standing right there in front of me was Bobby Flay, a man who I watch almost on a daily basis on the Food Network. I felt like such a retard, because there I was just starting at him, as he slowly walked by me. My stare must have been recognizable, because he quickly caught on to my gawking and came over to say hi. I has no idea what to do at this point, and suddenly the only thing that came out of my mouth was, "I watch you everyday! Can I take a picture with you!!!" I know, pitiful. Typical celebrity awe that makes you say the dumbest things EVER! Not to mention that it had been snowing and raining that day, so my hair was all crapped out!!! But he kindly and luckily said yes to our photo moment! Just wish I could've talked him into letting me go up to the Food Network Kitchens with him. That is so cool. I have always wanted to go to Chelsea Market. You look fantastic next to Bobby. Okay now, that is very cool!